United States (US) oil giant, ExxonMobil, has found even more oil offshore Guyana but a company spokesman would not be drawn into comment about the amount found. Spokeswoman, Kimberley Brasington confirmed an announcement earlier Tuesday by Minister of Natural Resources that there has been another major oil find. She said the Pacora Well, where the latest oil deposit has been found, is located about four miles north-west of the Payara-1 well. Last month, the company said the Ranger 1 well which contains 230 feet (70 meters) of high-quality, oil-bearing carbonate reservoir. Barring Wednesday morning’s scheduled announcement of the details of Pacora, the company said it has so far found 3.2 billion barrels of oil from six wells at the 6.6 million acre Stabroek Block. 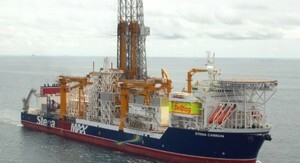 The Minister of Natural Resources labelled as an “excellent record” the work of the drill-ship, Stena Carron. “We so far have an excellent record and I would like to congratulate the crew of the Stena Carron which has been the ship that has done ninety percent of the discoveries without a day lost or any injury or any man-hours lost and that is commendable and, of course, it has been done in a very efficient way,” Trotman said in a video release. 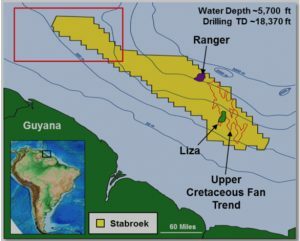 ExxonMobil is scheduled to begin commercial oil production from the Liza 1 well offshore Guyana in 2020. Guyana is entitled to 12.5 percent of the oil after 75 percent of the earnings is used to pay for the cost of investment and production. The remaining 25 percent- profit oil- will be split evenly between ExxonMobil and Guyana. Under the umbrella of the Bahamas-registered Esso Exploration and Production (Guyana) Limited (EEPGL), Exxon and its partners have spent about US$5 billion in searching for oil in the deepwaters offshore Guyana.